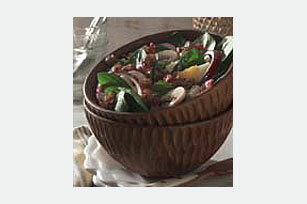 Fresh spinach, mushrooms, red onion and feta cheese are tossed with a warm bacon, walnut and balsamic dressing for a delicious side-dish salad. Toss spinach with mushrooms, cheese and onions in large bowl; set aside. Cook bacon in large skillet on medium heat to desired crispness, turning frequently. Remove bacon from skillet; reserve 2 Tbsp. of the drippings in skillet. Place bacon on paper towels to drain. Add walnuts to reserved drippings in skillet. Cook 1 to 2 min. or until lightly toasted, stirring occasionally. Stir in vinegar, oil, salt and pepper. Cook 30 sec. or until heated through. Pour hot dressing over salad; toss to coat. Top with eggs. Crumble bacon; sprinkle over salad. Serve with a whole grain roll. Prepare salad dressing as directed. Do not pour dressing over salad. Cool dressing. Refrigerate salad and dressing until ready to serve. Heat dressing just before serving. Add to salad; toss to coat. Top with eggs; sprinkle with reserved bacon.